Once upon a time not so far away from where you're sitting now, a little unicorn lived by herself in a clover glen. In the daytime she would sun herself beside the clean, sparkling stream. In the evenings she would sing to herself and it was such an exquisite sound that every nearby bird stopped to listen in wonder at the sweetness of her voice. At night she would sit still while the stars told her bedtime stories until she fell asleep. One morning while searching for a rare flower for her daughter's birthday the queen's sister happened to wander close by the glen. And from the glen she heard the most beautiful sound she had ever known. 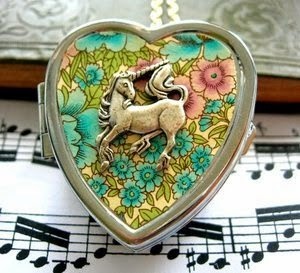 It was the unicorn's song. The queen's sister crept as quietly as her fine robes would allow her to do and she peered through the branches of a wild rose bush to look and see the source of that wonderful music.